Another SeaQuest location is under investigation, this time in Denver. The investigation comes after 13 Investigates found similar complaints and concerns here in Las Vegas and across the country. UPDATE FEB. 28: Another SeaQuest location is under investigation, this time in Denver, after reports of animals biting patrons and staff. UPDATE: On Feb. 22, Clark County Animal Control issued a citation and fined SeaQuest $2,000 for the unpermitted animals in relation to a recently born litter of Asian Small-Clawed otters. They've had to seal the otter exhibit from public view and can only keep the pups on site until April 30 to give them time to bond with and learn from their parents. Animal Control will re-check SeaQuest in late March to ensure continued compliance. SeaQuest asked the county to amend its permit to allow breeding, but Animal Control denied the request until SeaQuest becomes AZA accredited. The Association of Zoos and Aquariums accredits facilities that meet high animal welfare standards, but AZA told 13 Investigates even if SeaQuest applies, it would not be accredited because it falls below AZA standards. But there's something else Gina Greisen of Nevada Voters for Animals discovered regarding the otters. A combination of records from Animal Control and the Nevada Department of Wildlife document five adult SeaQuest otters. But their county permit allows for only two. "The numbers don't match up. So where are they?" Greisen wondered. "Are they dead? Are they alive? Are they hidden? Were they sent off to other facilities? Did they get loose? We don't know!" And at this point, neither does Animal Control. When we asked, they said that discrepancy is still under investigation. LAS VEGAS (KTNV) -- SeaQuest has quickly become a popular place for Las Vegas families. But former employees, animal advocates and veterinarians say the interactive aquarium at the Boulevard Mall has a dark side. 13 Chief Investigator Darcy Spears exposes what critics call a trail of dead animals in pursuit of profit. On the surface, SeaQuest comes across as a family-friendly hands-on experience. Dig deeper, and you find people worried the attraction is all about cash flow and the animals are considered disposable. "They die and they just replace them and no one cares," said Gina Greisen of Nevada Voters for Animals. "Everything they did was in the pursuit of money," added former employee Chris Stansell, who left SeaQuest in 2017 over animal welfare concerns. Whistleblowers have come forward here in Las Vegas and at other SeaQuest facilities across the country. A veterinarian from the Portland aquarium told the Oregonian newspaper the death toll was "Excessive," saying, "I feel those animals were subject to undue pain and suffering to save money." The place shut down in 2016. In Long Island, New York, where SeaQuest is trying to open a new facility, actor Alec Baldwin penned an impassioned plea to the Oyster Bay town board urging them to block SeaQuest, citing a long history of animal neglect allegations. Here in Las Vegas, a protest over animal deaths erupted just a few months after the facility opened. For my current investigation, I spoke to five former employees who all worry the interactive environment is dangerous for the public, the staff and the animals. "Oftentimes because they let people walk around, the kids would stomp on the birds and kill them. And then they would throw the birds in the garbage so they didn't have to record it or show that the birds were dead," said former employee Marc Heller, speaking about what he saw in 2017 that led to him quitting over animal welfare concerns. Chris Stansell said it happened with turtles too at that time. "They had smaller turtles that were given to kids to handle. I think they started with 12. By the time I left they had three. Because they were not taken care of. They were on rotation and I know some were actually crushed by kids." SeaQuest dismissed Stansell as disgruntled when he first spoke out. "I have nothing to complain about other than the animal neglect, which absolutely I will complain about, and if you want to call me disgruntled in that sense, absolutely I'm disgruntled," said Stansell. He's among many who say it's high time authorities like Animal Control and the USDA take meaningful action. "In allowing these people to continue to operate and not be held accountable they're allowing animals to continue to suffer," said Heller. "I especially want people to know this is not a happy place. These are not happy animals." In addition to the deaths described by Heller and Stansell in 2017, 13 Investigates discovered a more recent animal death -- an Asian Small Clawed otter that died in May, 2018. "And it was just heartbreaking," said Gina Greisen. She obtained the necropsy report for the otter, which says "... The stress of shipping to Vegas, introduction to a new environment and caging during construction may have caused fatal cardiac consequences." "It was really disgusting to see how these animals were pretty much made into attractions and just numbers on a sheet," Stansell said after we told him about the otter. "And so when one died, it was just replaced with another one." All five former employees we spoke to say the recent otter death is par for the course. Marc Heller recalls, "Originally there was a larger octopus and something happened overnight where the temperature switched and it literally cooked alive and burned to death in its own water." "When it died they just replaced it with another one and then pretended like it never happened. And then that one died and they just replaced it with another one," said Stansell, referring to the octopuses at SeaQuest in 2017. Employees at the time took pictures and video showing a sump room wall covered in black mold, a dead turtle they say was left to rot for days in the koi tank, and a bug-infested drain in the aviary where they say birds drank and bathed before interacting with guests. "If you just peel back some of the layers and look at this for-profit aquarium, you'll see that these animals are just disposable and no one seems to care," said Greisen. "There are three agencies that oversee SeaQuest and no one tracks the number of animals that die." The USDA says SeaQuest must maintain records of animal deaths, but doesn't have to report them to anyone. The federal agency inspects and regulates minimum standards for things like cages and lighting. The Nevada Department of Wildlife just handles permit paperwork. Clark County Animal Control has the most direct oversight. Marc Heller told us "People did call Animal Control on them and Animal Control did come more than once and they did absolutely nothing when they came, which is also a shame." Animal Control has been documenting complaints and concerns ever since SeaQuest opened. But the only citation they've issued came in October, 2018 when a capybara escaped and was badly injured. Animal Control records show it was being "Transported in a dog carrier with stripped latches in an open-bed SeaQuest pickup truck with a tailgate that also didn't latch properly." Animal Control wrote "It is a public safety issue to not have proper transport equipment in place for the wild animals." Other Animal Control records dating back to February 2017 note visibly sick lionfish left on public display, dirty water in the octopus and starfish tanks and birds going bald. A month earlier, Animal Control found excessive feces in the overcrowded parakeet enclosure, sick and dead garden eels and dirty freezers oozing an unknown substance. "But for whatever reason they just haven't taken the necessary action," Heller said. Animal Control wouldn't talk to us on camera for this story because of its open investigation. One they just wrapped up after a mandatory quarantine period involved two employees who were bitten and scratched by a coati mundi on February 9. The other, open investigation involves illegal breeding of otters. "Specifically that was one of our concerns -- that there would be breeding," said Gina Greisen. Clark County code prohibits SeaQuest from breeding. Animal Control told us "SeaQuest's exotic permit is currently under review as part of an active investigation." Despite the direct violation of their permit, SeaQuest sent out a press release on Valentine's Day about the babies being available for selfies with the public and for up close interactions at $20 a pop in the Spring. "They're just trying to crank out annual memberships, which the employees all have quotas on, which I know because I was in Guest Services--and they're interested solely in revenue and not the welfare of the animals from what I've seen," Heller said. In response, SeaQuest said, "SeaQuest offers annual passports which allow families to visit unlimited times during their membership term for an affordable, fun and educational experience. In addition, SeaQuest Cares, the organization's non profit initiative supports community based programs and organizations through in kind donations. In 2018, SeaQuest Cares donated more than $150,000 in annual passports, passes, and events to support animal rescue, children, families, and veterans." The former employees and animal welfare advocates we spoke to say they have an issue with the very premise of the attraction. "The interactive part sounds like a really good idea until you put it into practice," said Chris Stansell. "You have to make sure that every single person who works in that environment is trained to be able to handle those situations." They say lack of training extends beyond Las Vegas. Customer: "Oh, you can't touch him?" Employee: "I'm not supposed to. I'm not husbandry. I'm not trained on touching them unfortunately." The staffer who does put the fish back is alarmed at how long it was allowed to struggle on the floor. Employee who put fish back in water: "How long was he out?" Other staffer: "A few minutes." Third employee: "Two at the most." At the SeaQuest in Littleton, Colorado, state records document 30 injuries from animals suffered by staff and customers from June, 2018 - January, 2019. They include a stingray barb getting stuck in someone's hand, a Burmese python striking and latching onto someone's hand, and iguana, tortoise and shark bites that drew blood. SeaQuest is not AZA accredited. The Association of Zoos and Aquariums accredits facilities that meet high standards for animal care, veterinary programs, conservation, education, and safety. Mandalay Bay's Shark Reef is AZA accredited. AZA told 13 Investigates that SeaQuest could not be accredited because it falls below their standards. "You have to look into what actually is behind the company," said Stansell. The Covino brothers started SeaQuest, which now has five locations across the country. Vince Covino is the CEO. His brother, Ammon Covino, served federal prison time in 2013 for wildlife trafficking. He illegally harvested spotted eagle rays and lemon sharks for an aquarium in Idaho. He then violated court-ordered employment restrictions and lied to his probation officer by working with SeaQuest facilities in Layton, Utah and Las Vegas. In 2016, he was sentenced to eight more months in prison. "I think the only way that SeaQuest or these animals are going to be able to exist in an interactive environment is going to be taking it away from the people who run this company," Stansell said, "because it's rotten from the very top." 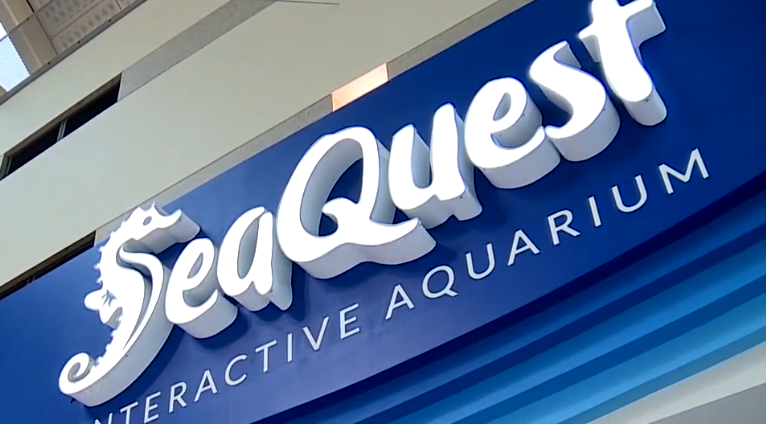 13 Investigates worked diligently to get answers from SeaQuest, talking back and forth with CEO Vince Covino, even emailing a detailed list of questions and concerns, but he would not go on camera.